You might remember that I've recently reviewed both the beef and pork injections from Kosmo&apos;s Q. 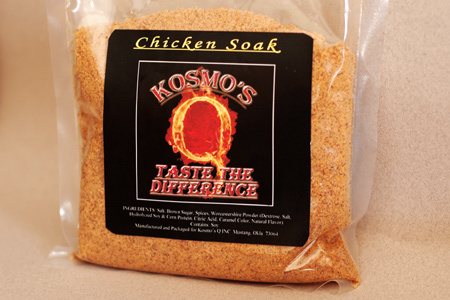 This time out I'll be giving my thoughts on the relatively new Chicken Soak product from Kosmo. Let me be clear in saying that I am a huge fan of brining poultry. I won't get into all the science of osmosis and the denaturing of protein here, but suffice it to say that it really works wonders. The bottom line is that it adds a ton of flavor and moisture to what can often otherwise be dry and boring meat. Not only is brining just an all-around good idea, it's indispensable in competition barbecue. At a contest you have one or maybe two bites to impress the judges. Flavor and moisture are the two main criteria that will separate a competitor from the also-rans. One of the pains of brining is the cooking that is required to get all of the sugar and salt dissolved into a solution. Then you have to cool it down. My typical process entails making what I call a "brine concentrate". That means that I add just enough water to the sugar and salt to get them dissolved, then I dilute it when I'm ready to use it. For competition, this minimizes the hassle when I get there, but in reality I've just shifted the work. I still have to make the concentrate. Here is where I think Kosmo's Chicken Soak really shines. It contains very similar ingredients to my usual brine, but it dissolves in cold water. You just add 3/4 cup of the dry mix to a half-gallon of water, stir, and go. Just soak the chicken parts for four hours, then barbecue or grill as you normally would. There's no muss and no fuss. The labor savings are all well and good, but how good is it? I will say that this product works exceedingly well. It dissolves quickly in cold water with no caking or lumping. As for flavor and added moisture, it's great. I cooked up some boneless/skinless breasts and bone-in thighs and both were outstanding. I'd put this up against my competition brine any day. I always brine my birds, or at least almost always do. It makes a huge difference and IMHO makes the birds more forgiving in the cooking process. I haven't tried Kosmos yet. Works great on turkey too!